We told you it was coming, and now here it is! We’ve flipped the switch and our new design is here. The homepage isn’t dead, far from it. Our new homepage sets the agenda for ‘right now’ with the stories we think you need to know first highlighted in a beautiful new cover. Read more about our cover. The rest of our homepage consists of a series of themed ‘shelves’ guiding you through our latest stories about topics like apps, gear and developer-focused tech. We can add extra shelves as we need them, so Google I/O or Apple’s WWDC might have dedicated homepage space, for example. Of course, there’s a shelf for all the latest news, as we know many of you like to see everything we’ve published in order. From there you can click through to a full stream of all our articles. We’ll be taking a closer look at shelves in an upcoming article. Sometimes an article doesn’t need to be 500 or 2,000 words long. Sometimes a video tells the story best, sometimes a tweet with a bit of context is all we really need. 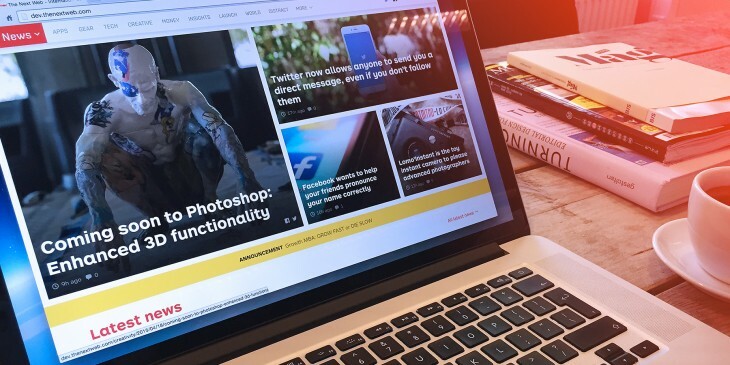 The new TNW allows us to tell stories more effectively with the help of a variety of article formats. Look out for different formats across the site from today. What if display advertising could be enjoyable? That was the question we started with when we began work on our new Canvas ads. On some pages you’ll see an ad that opens up to a beautiful full-screen design, sometimes with video. You know those gorgeous, full-page ads you see in premium print magazines? Now they’ve arrived on the Web. We’re even welcoming in young talent by offering Canvas ad space for free to up-and-coming designers and artists. Look out for some fantastic art occasionally cropping up as you browse the site. Read more about our Canvas ads. This is just the beginning. In the coming days and weeks we’ll be introducing new features such as rich new channel pages. Welcome to the all-new The Next Web.